All players are around the goal with a ball each. The goalkeeper is in the goal, facing it. 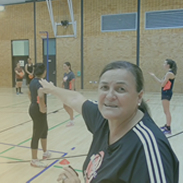 The trainer points to someone to shoot. The trainer blows his whistle and the goalkeeper quickly turns around and stops the shot.